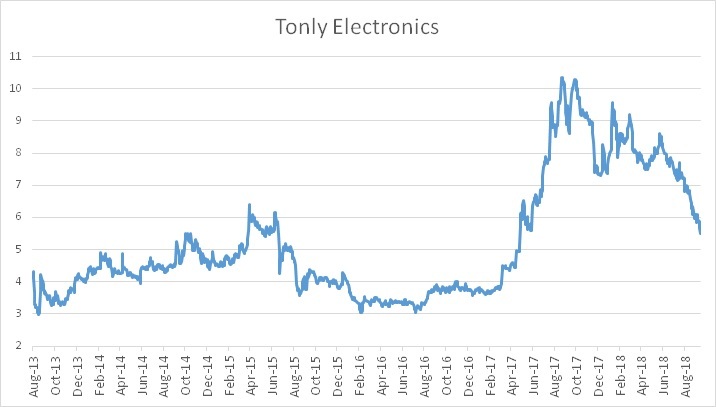 What does Tonly look like today and why is the stock price plummeting lately? Let’s find out.. Audio products – Originally this was more geared towards sound-bars and other small speaker systems. Soundbar sales has seen significant growth during 2017 but wireless speakers has contributed even more. Tonly also ventured deeper into the headphone and earphone space. After landing a cooperation with the Harman group, which also carries brands as JBL and Infinity, this headphone sales has increased to 300m HKD in 2017. Tonly is pouring quite a lot of research into this area, producing high end noise cancelling headphones, voice translation products and much more. The co-operation with Harman is the main reason Tonly sales increased so significantly in 2017. 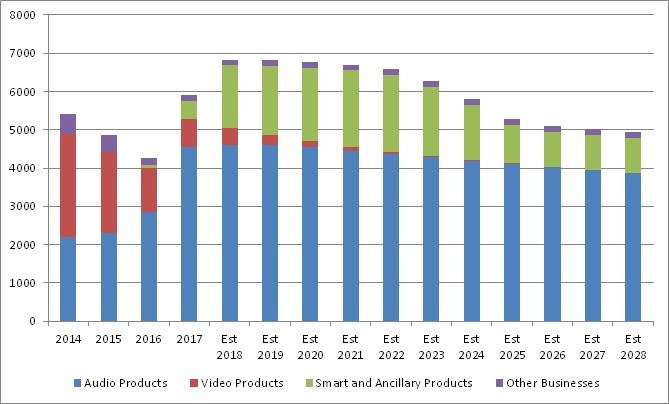 Video products – This is mainly the legacy segment, which still in lower volumes produce DVD/BluRay players. 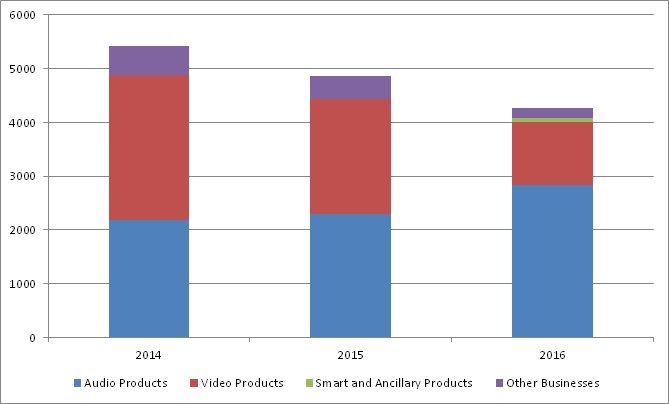 Another sub-segment which for a short while boosted sales in China was different types of Set Top Boxes (digital boxes) used for TV services. This segment is not entirely dead yet, for example very recently this was announced: Synaptics and Key Ecosystem Partners Launch Android TV Turnkey STB Solutions Enabling Fast Time-to-Market for Pay TV Operators. 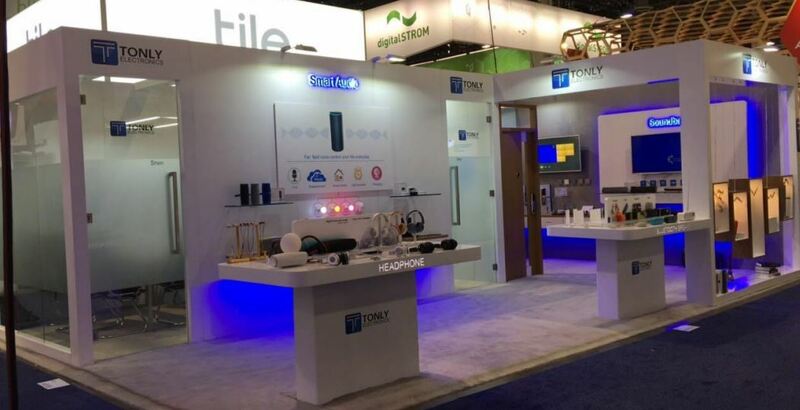 Smart & Ancillary products – The big hit product here has been smart speakers, where the company seems to have got a very good foothold, more on this later. 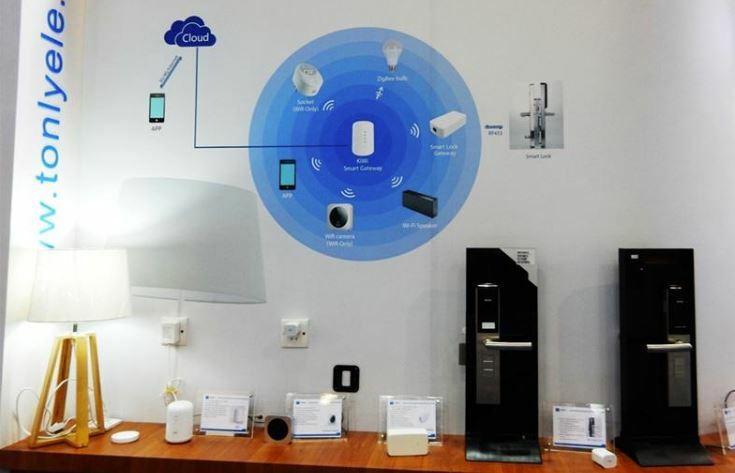 As can be seen in the second picture above, the company for quite some time has tried to develop a range of smart home and security solutions. 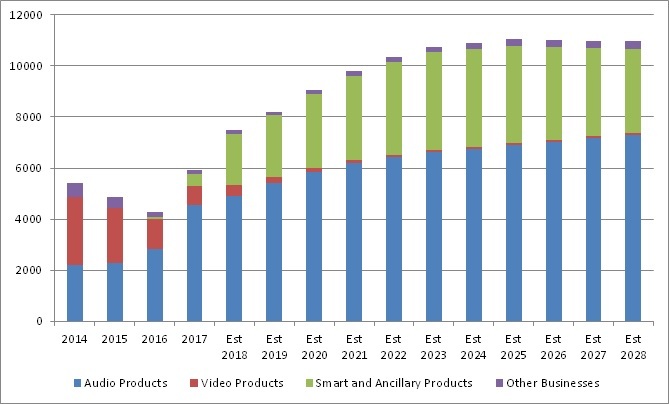 The smart home range has not (yet) added any significant revenue growth. Given that the video segment is neither the focus of the companies future growth and how small this segment has become lately, I will not expand further on this products segment. In the segment analysis I had to rely quite heavily on sell-side research information for some specific details. Annual reports do not mention specific customer names. Some details can be found in circulars (like this) but sell side research has much more detailed information. There are two smaller firms covering Tonly: Anli research and Orient Securities. Anli’s two latest reports are available online: Anli on Tonly March 2018, Anli on Tonly Aug 2018. The above is an example if a wireless speaker, that could have been produced, assembled and perhaps even designed by Tonly. However there is no such disclosures available given that JBL uses multiple suppliers. In the audio segment, according to Orient Securities, Harman and Sony are the two major customers of Tonly. Harman stands for 42.8% of total sales in 2017 and the top five customers stand for almost 80% of sales. Just as for my other holding Dream International, the life of a OEM/ODM producer is being at the “mercy” of a few larger customers. But this is nothing unique, the world’s largest such producer, Hon Hai precision, aka Foxconn is extremely dependent on Apple. But it is important to understand which companies Tonly is reliant on, given that if they out-perform the market, most likely Tonly will out-perform as well. Harman was aquired by Samsung in 2017 for 8bn USD. Within the Harman Group are a number of brands, like JBL, AKG and Infinity. According to what I have been able to find, Samsung has not intended to change how the Harman group of brands should be run: JBL, AKG and Infinity brands to live on under Samsung. Rather Samsung has helped Harman to invest further in taking market share. This doesn’t mean that Tonly sits secure as one of Harman’s main suppliers of audio products. But I haven’t been able to find any information that the co-operation has weakened. The sales figures for 2018 are also speaking very positively that no disruptions has happened. In the end it all comes down to Tonly’s execution of assembly and own product designs. The big growth driver in the past (in this segment) has been wireless speakers (as the JBL speaker above). The latest growth driver has been Tonly’s move into head and earphones. 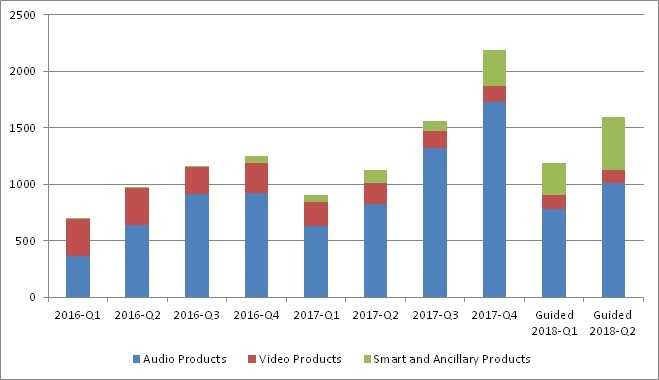 Headphone revenue grew from 116 to 300m HKD between 2016 and 2017. These type of products have a much shorter life-cycle compared to for example TVs or DVD players. Both wireless speakers and headphones are product which experience much more wear and tear. This high churn creates high sales volumes, but also a constant need of product development. The company needs to constantly put efforts into being at the forefront of technology or someone else will step up with a more advanced product. In the case of Tonly, this is mostly a co-operation with the companies they produce products for. The better Tonly’s R&D is, the likelihood of winning more business increases. 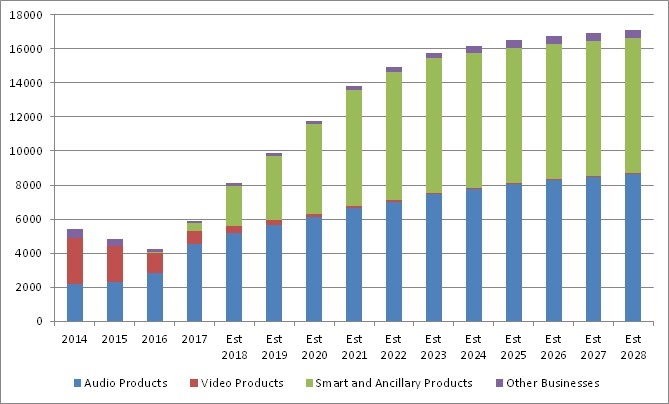 Smart speakers & ancillary products segment – the future or short lived hype? One can understand that the leap from wireless speakers, to a similar speaker with some added smart microphone technology, isn’t very large. Somewhat luckily for Tonly this has emerged as a new huge growth driver in the market. As a big producer of wireless speakers Tonly was in a pole position to deliver smart speakers. Let us take a closer look what is going on in this area. Smart voice controlled speakers is a new concept, basically starting with Amazon’s launch of Echo, in the end of 2014. This was released in a very limited scale and it wasn’t really until 2016 that the whole smart speaker concept took off. As can be seen in 2016, Amazon Echo powered by Alexa, was THE smart speaker. In 2017, other entrants started to take market share. 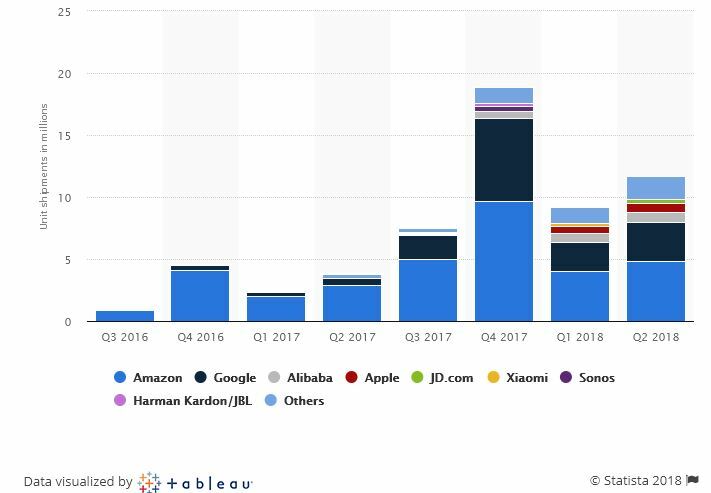 The below picture gives a view of the explosive sales in Q4-2017, where Google stepped up in a major way with it’ Google Home products. The story for 2018 is very much about China catching up in this product trend. Alibaba and Xiaomi being the two main players fighting for market share through aggressive price cuts. This was an excerpt from Strategy Analytics press release from Sep 20th: 49% of Smart Speaker Users Can’t Imagine Life without One: Strategy Analytics. I think this is another case of big companies, pushing out a product, to create a need we didn’t even know we had. The more you read about voice servies you realize these big companies how long term plans on how to seamlessly integrate voice services (in for example our cars) in our lives. I have got renewed respect for that this is probably just something I am a late adopter of. This is not going away in a few years as yet another hype. I’m therefor bullish on that this product will just keep growing, until most of us have a few on these small speakers around our homes, in some shape or form. And there is a long runway of growth before we are there, especially in Asia. 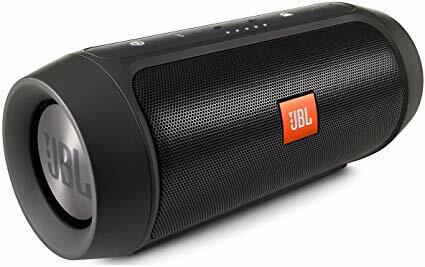 If Tonly designs and/or assembles for example soundbars to JBL, the economics in such a transaction is very different from smart speakers. JBL obviously wants to pressure Tonly to produce the product to the lowest possible cost but still with the quality levels that JBL has decided to uphold. After that JBL wants to maximize it’s net income on the product, balancing price, sales efforts and volumes for the best possible outcome. This mix will probably lead to a fairly expensive soundbar product with decently high margins for JBL and less volumes sold. When Tonly produces (components or design) a smart speaker, it will again be pressured to deliver a quality products to the lowest possible cost. But when these huge companies like Google, Amazon, Alibaba and Xiaomi are fighting for market share, something very different will happen in the equation of margins and volumes. 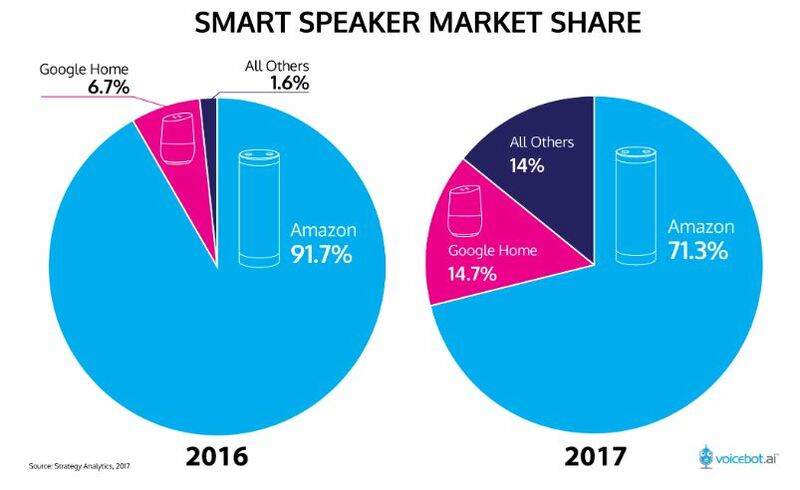 A company like Google has very low incentive to make nice margins on it’s speaker, after all this hardware product is just a vehicle for Google to spread its usage of Google Assistant. The company has a long term strategy to win the “war” on what voice assistant service we use in our daily life. Google probably couldn’t care less about the profit margin of the speaker itself. We already have proof of this happening especially in the Chinese market, where steep discounts were given on Alibaba’s speakers. This is the best possible product for a company like Tonly to produce. Given that the big brands even might go as far as subsidizing the sales of the product to reach out with it’s software services, which almost guarantees explosive volume growth for the companies building the speakers. Again, creating a need we didn’t know that we had. According to Anli: “Tonly provides grille cloth for “Google Home”, components for harman/kardon Invoke with Cortana by Microsoft, and collaborates with local e-commerce brands in product design & production such as Alibaba’s “Tmall Genie X1″ and JD.com’s DingDong.” This is in-line with what is communicated by Tonly, where the “Ancillary” products segment saw growth from 102, 186m in revenue between H1-2017 and H1-2018. This segment according to Tonly “Mainly include fabric covering for external sales, plastic injection structural parts, speakers, wireless modules, and other components”. According to Orient Securities: “Tonly remains the largest ODM supplier of T-mall Genie with over 80% allocation”. This is what I’m most positive about, here Tonly is not making a few components, but has actually designed much of the speaker in co-operation with Alibaba. 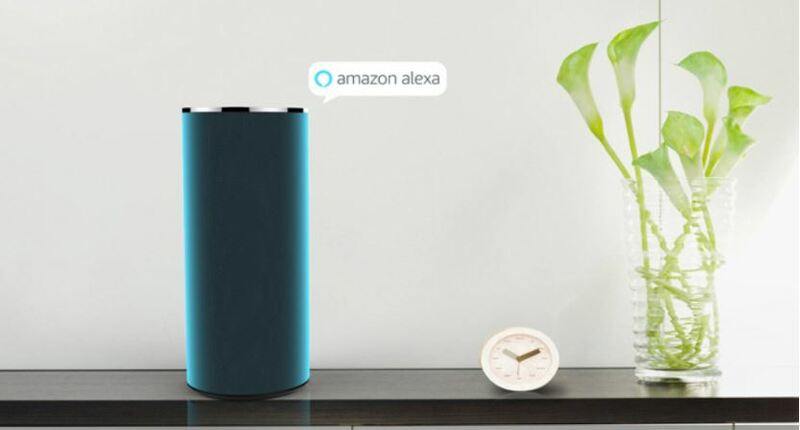 Alibaba has a strong position in the Chinese market, which is just starting to take off, combined with how aggressively Alibaba has been pushing it’s product: Alibaba Discounted its Top Smart Speaker to $15; Sold 1 Million. Singles day is again soon coming up, it will be very interesting to see if Tonly has been able to keep it’s strong position with Alibaba. I have fairly high confidence that Tonly has a good position in the smart speaker market for now and it’s R&D efforts should mean it can keep at least pace with most of the competition. As mentioned in the background the majority owner of Tonly is Chinese electronics group TCL. The current structure is as following: TCL Corp is listed in China with a MCAP of 38bn CNY. TCL Corp owns 48.2% of Tonly. TCL Corp is also the main shareholder of Hong Kong listed TCL Electronics, with a MCAP of 8.4 bn HKD. 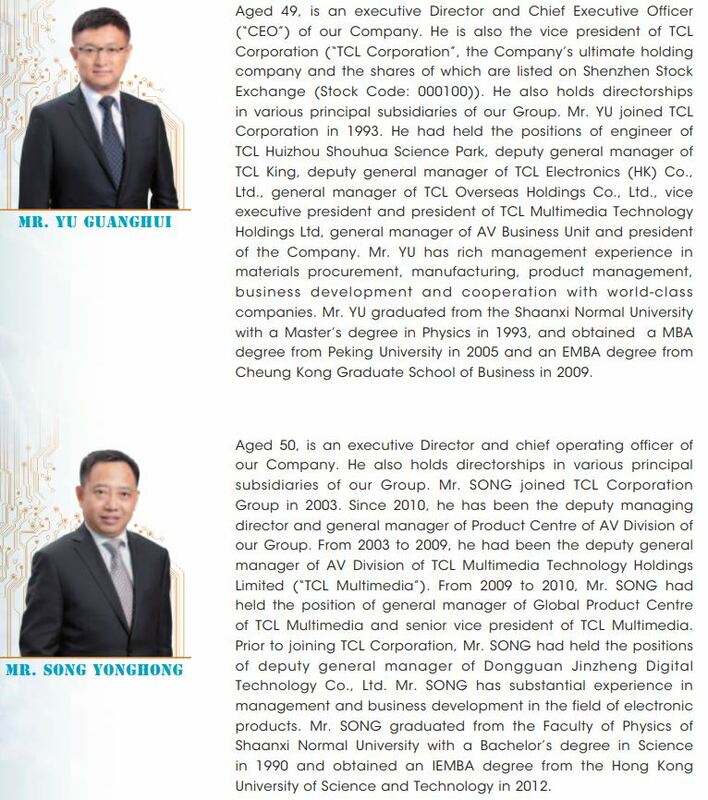 With such a majority stake in Tonly and since Tonly is a TCL spin-off, it’s not very strange that all of Tonly’s management team has strong ties to TCL. Lately a generous option package has been launched mainly for senior management (link to press release), but also for a wider group of employees. (iii) Share Options carrying rights to subscribe for 2,614,706 Shares are granted to 80 Option Grantees for their special contributions to the Group, in their capacity as employees of TCL Corporation (the ultimate holding company of the Company) and/or its subsidiaries (together, the “TCL Corporation Group”) (the “TCL Corporation Employee Grant”). That category (ii), a wider group is included in the option scheme I see as a huge positive. I’m more skeptical to that senior management should be awarded such a large number of options. Two mitigating factors explaining this would be, the base salaries of senior management is fairly low and, the strike price of the option program is not set at a discount but current market price at the time of the grant. Meaning that the options are currently trading far out of the money (majority of options have strike price 7.84 HKD and a previous batch has 9.6 HKD). If the company continues to significantly dilute other shareholders with huge option packages, I will be skeptical to keep owning this long term. But it wouldn’t make sense to do so, because TCL would be diluting themselves and get a poor return on their investment as well. I think this option grant has been a one-off, for managing to nicely turn around the company and set the stage and incentives for management to stay on and move this company into a new phase of growth. Seen in this light, I think Tonly has the perfect structure of a small cap company. A strong majority owner and a good incentive structure in place for senior management and even a larger group of important employees. The second round of tariffs (which starts at 10% and moves to 25% early 2019) will hit Tonly more significantly, since it includes most types of electronic equipment. This is also something I spent quite a lot of time contemplating. Something like clothes manufacturing, is pretty easy to move somewhere else, basically garment can be supplied anywhere and you just need to find factory workers to sew the garments into clothes in factory. Still not the easiest thing to move but doable. When it comes electronics, the supply chain is immensely more complicated. The number of sub-suppliers to Tonly of different electronic components to assemble for example a smart speaker, is much much harder than getting hold of garment. China has over the years created a whole eco-system in the Guangdong region for this type of electronics production. It means that it’s much harder to just uproot your factory and move it to say Vietnam, and start to assemble speakers there. Again it is probably doable and 25% tariffs is pretty damn good incentive in a low margin business, but this will take time. How Tonly will fare in the competition here will be crucial, as long all the competition is sitting in China as well, it is a equal playing field. I do worry that for example Taiwanese companies will be able to use this as a big advantage to gain market share. I think this is the major reason why Tonly has trade down so significantly since this summer. Another worry is how quickly the business seems to be shifting. These huge companies can one year demand huge volumes produced and the next they are out competed by a better product and volumes just collapse. In such an environment it is hard to manage your workforce and production capacity. Tonly is bound to have an off year now and then, when volumes collapse and perhaps lay-offs are needed. With illiquidity in the stock price, it’s easy for the stock to both overshoot on the upside as well as trade way under some type of “intrinsic value”, which I believe is the case currently, even though we have the Trade War to worry about. I did not spend so much effort to compare Tonly to other companies. The main reason being that no other company has the exact same profile as Tonly. It rather larger players which has a sub-segment within Tonly’s area, just as it used to be for TCL. Some larger company keeps being mentioned though as I was doing my research. One is China listed Goertek, which has a MCAP about 25 times as large as Tonly. They clearly state that they are working in the smart audio field. Another company that comes up on the radar is Taiwanese listed Wistron. Wistron is listed as a ODM providers of the Alexa Solutions. These are bigger companies which are involved in many of the areas Tonly is competing in. Tonly is a small player, focusing in these acoustic areas, with the owner, TCL involved in a wider field just like these competitors. It’s very hard to draw any conclusions, since operating margins vary widely. These companies have also traded down lately, but still trading at a P/E of about 12-14. Obviously there will be competition for Tonly, and the slim margins also tells the story of high competition. But I believe more in a smaller company focused in a niche area, than a large company trying to do everything. Tonly lives in a fast changing world of consumer electronics. They could tomorrow win a new large customer, or lose a current one. Forecasts of future revenue and margins is all a guessing game. That doesn’t mean we should skip it, just be humble about how hard predicting future outcomes are. I have tried to weigh in all of the above presented information on the different segments, I’m impressed by the track record of quickly taking market share in new segments and the turn-around the company has survived. On top of that I think management and staff is nicely aligned, which for sure will tilt probability of success upwards. In the other scale, we have worries like USA/China trade-war. Below are my Base, Bull and Bear cases of future Revenue, which is modeled out of the quarterly revenue data. The 2018 is a bit more reliable, since the first half year figures are already confirmed. There is a case for that Tonly’s new product range should have higher gross profit margins than the old products. It is products with heavier investments in R&D, so everything else equal is should yield higher margins.. But at the same time headwinds are playing against Chinese companies, with raising material costs and high labor wage inflation. Scale obviously also helps with margins, so depending on how volumes develop, that will also affect margins. Below I have just modeled margin on a Net level, which as you can see is very low. Small changes in margin, gives a large change in net profit. To not margin assumptions drive my whole valuation forecast I stayed within a fairly narrow range of Net profit margins, it feasible that in a bull or bear case, that margins actually could move up or down, more than I forecast. I put the probabilities of Base, Bull & Bear and 50%, 20%, 30% respectively, giving me a target price of 10.8 HKD per share. I up the Bear case probability due to trade tariffs. This is probably the best margins of safety I found among the stocks I looked at over the last few years. Usually my bear case will end up being at or below the current price. But here I can’t even see a future scenario where the company is worth less than the 5.5 HKD it’s trading at today. The explanation of that it much thanks to the big cash buffer the company holds, with 724 million HKD in Net cash, on a Market Cap 1470 million HKD, the companies future cash flow generation has to be pretty poor to not added together match the current market valuation. This doesn’t mean that this is a sure thing, the company could still fall on hard times and the management waste the cash on terrible investments, but it seems highly unlikely as it stands right now. One could also discuss if a 15% discount rate is correct, it is high, but at the same time, this is a fairly illiquid company where future revenues are highly insecure. So in my view I think 15% is fair. If we in my bear increase the discount factor to 25% (which is extreme – cash flows 3 years out is worth 50% and 10 years out 10%), the valuation comes out at current market price of 5.5 HKD. Another base line valuation approach would be to look at the strike of the largest portion of option grants, at 7.84 HKD. Up to slightly above this level the stock should be clear buy, given the even lower valuation per share if the dilution is not happening. Tonly is today trading at 5.5 HKD per share. Fully diluted, for my estimates the company will generate 0.81 HKD per share on the last line for 2018. 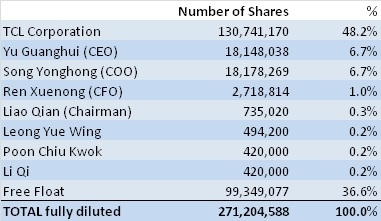 Tonly has 2.7 HKD per share in Cash and paid out 0.35 HKD per share in dividend last year. Tonly spends about 1 HKD per share on R&D. It has an attractive ownership structure in place. Further I’m estimating in my base case (which I think is fairly conservative) that top-line will grow with an annual rate of about 12% per year for the next 5 years. All this gives me that the stock looks very cheap, up to about 7-8 HKD per share, but very reasonable to hold on to, at least to around 10.8 HKD per share, which is my target price. I’m very bullish on the company at these valuations and the growth prospects are ideal in smart speakers, when big brands just want to push their software. I like the high R&D spend and the high dividend yield gives another safety against falling into a “value trap”. I take a 5% position of my portfolio and this goes initially into the “Opportunistic” bucket. I will need to see more of the execution of management, before I can consider to move this into my Long Term bucket. What I want to see is how the trade tariffs play out and if management continue to navigate this challenges as well as it done with challenges in the past. In the next couple of weeks the company will release its Q3 sales estimates, if that is in-line with my base or even bull-case I will consider increasing my position even further. After a long series of more Portfolio Management oriented posts, I’m back to trying to come up with good investment cases. I hope you enjoyed this analysis, it only takes you a few minutes to read through, but I spend weeks of my spare time to get something like this together. I play around with my forecasts and do a lot of background research that here sometimes is just summarized in a sentence or two. As always do your own due diligence. The whole era of losing DVD/Blu-Ray sales, was something similar, were Philips stood for a major part of the Revenue. They managed through that without losing money actually. It’s hard to say, but it seems plausible that business would not do great if the major customer quickly pulled all-out. But the track-record of turning the business around in that case was one major factor for me choosing to invest. Excellent and thanks for sharing!